FOLK ALICE FOLK (nee Muzic), age 97. 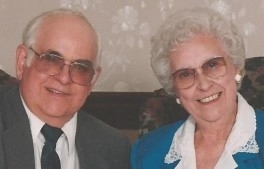 Beloved wife of the late Robert; loving mother of Richard (Janice) Yanusaitis and Kathy Folk; dear grandmother of Christine (Ben) Ricci and Richard (Michelle Glass) Yanusaitis; dear great-grandmother of Hayley and Hunter Ricci; sister of Mary Smith and the following deceased: Joseph, Frank and Harry Muzic. Funeral Services Thursday, January 16 at 10:00 A.M. at the JAKUBS & SON FUNERAL HOME, where the family will receive family and friends WEDNESDAY FROM 4-8 P.M. Interment Western Reserve Memorial Gardens. In lieu of flowers, memorial contributions may be made to Hospice of the Western Reserve, 17876 St. Clair Ave., Cleveland, OH 44110 or St. Jerome Church, 15000 Lake Shore Blvd., Cleveland, OH 44110.